Easy Carrot Walnut Cake made with grated carrots and nuts is just ideal for an afternoon tea-time treat. Carrot Cake With Nutmeg and a sprinkling of cinnamon is a yummy, moist cake recipe with a distinct flavour. This simple and easy cake recipe with carrot and walnuts is fully of sweet, nutty flavour in each bite. You just can’t keep your hands off this cake. The walnut carrot slices of cake taste so good and the big plus point is that carrots and walnuts = healthy, so that makes this cake healthy. Ha, that’s my line of thinking. Carrot cakes made with freshly grated carrots with some coarsely pounded walnuts tossed in, makes for a tender cake. Carrot and Walnut Cake is a deliciously rich and flavourful cake. This is my first homemade carrot cake recipe and it turned out great. Worth every bite! 1. For this classic carrot walnut cake recipe, break the eggs into a bowl and whisk well. Slowly add the oil and blend well. 2. Mix in the brown sugar and combine well. 3. In another bowl mix together crushed walnuts, grated carrot, ground cinnamon, nutmeg, baking soda and baking powder. Add this to the sugar-oil-eggs mix. 4. Slowly add the flour and blend well to form a thickish batter. 5. Preheat the oven to 180 degrees Centigrade. 6. Grease a baking dish and pour the carrot walnut cake batter into it. 7. Bake Carrot Cake With Walnut Nutmeg at 160-180 degrees centigrade for 45 minutes. 8. Remove onto a wire rack to cool. Enjoy delicious and easy Carrot Walnut Cake with a hot cup of tea. If you are looking for more carrot recipes, do try out Carrot Yogurt Dip and Carrot Thoran. Carrot Walnut Cake is a deliciously moist and tender cake made with grated carrots and crushed walnuts. The cake is full of flavour with carrots and walnuts in every delicious bite. It’s perfect with a cup of coffee for breakfast! An easy recipe for Carrot Walnut Cake. Here's the recipe for walnut carrot cake made from scratch. Mix the eggs and vegetable oil and beat the mixture until it turns fluffy. Add sugar and continue beating the mixture. In a different dish add the ground walnuts, grated carrots, ground nutmeg, cinnamon, baking soda and powder. Add this mix to the (2, 3) eggs and sugar. Now, add the flour and mix well. You will get a cake mix that is thick in consistency. Apply butter/vegetable oil on the walls of your baking dish. Transfer the cake mix to the baking dish and bake at 160-180 degrees for 45 minutes. 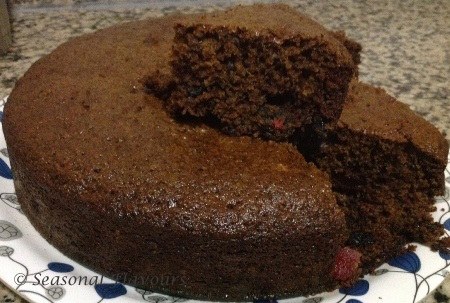 Stick a toothpick in the centre of the walnut carrot spice cake after 45 minutes and if it comes out clean, your cake is ready. Once done, leave the Carrot and Walnut cake to cool. Cut into slices and serve yummy Carrot and Walnut Cake with a scoop of ice-cream! *You can add 1/2 tsp of dry ginger, 1/2 tsp of ground cinnamon and 1/2 tsp of ground nutmeg to the cake mix.